Whether you place these Antiqued Rustic Wedding Centerpieces in the middle of every table or save the design for the guestbook table, the look is sure to wow. Individually these items are nice, but together they create a dynamite wedding table craft. This entire look can be created for under $20, and once you have the supplies, each table will cost mere change. This delicate look can easily fit any wedding color scheme by switching out the flowers to match the rest of the room. For a more upscale look, choose gold leaf rather than silver and spray paint your lantern black. With those changes, this DIY project is instantly a Gatsby sensation. 1.) Wash and dry the vintage lantern. 2.) Spray paint the vintage lantern. If you are not using antique spray paint, once the regular spray paint is dry, use sandpaper to give it an antique look. 3.) Wash and dry candle holders and vases. 4.) If you aren't using the item to hold anything, you can leaf the inside or outside. If the item is holding water or a flame, leaf the outside. Spray the surface with metallic leaf adhesive, and let dry. The more adhesive, the more leaf that will stick. For a very antique look, use less adhesive. 5.) Apply the leaf, per the directions. Press down the leaf against the adhesive. If you want a more weathered look, hold the leaf and dab it against the jar. For a fuller look, place the leaf down and peel off the back. 6.) Once done, brush off the surface. Excess leaf will fall off. 7.) Fill the containers with flowers and/or candles. Here's how to arrange flowers. 8.) 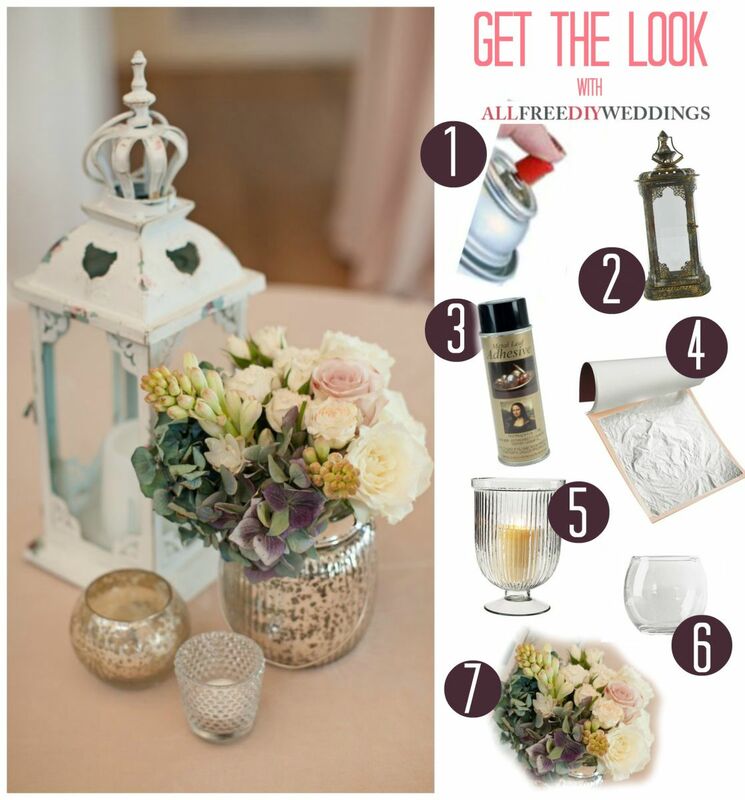 Place the lantern, candles, and vase in the center of your table. I really love the rustic, romantic feel of these centerpieces. Plus, they look really easy to achieve which is great for busy brides.